After a period of illness my writing journey first began when I started creating websites with Google Sites and also writing on Websites such as Hubpages and Squidoo. Having my mind occupied on other things really helped with my depression and also gave me confidence to move forward in my life. As time went on I gained more knowledge, discovering ways to improve my blog and my writing making it more user friendly. Always taking note of where I would go wrong and how to remedy my blogging problems. The potential and power of a blog is valuable, yet simple and inexpensive tool for getting your thoughts across. Millionaires have been made, writers have been discovered and businesses built all through the medium of blogging. Blogging can lead to countless opportunities both personal and financial. With such a powerful tool and combining it with social media can create massive exposure previously unheard of before the internet. Starting a blog will not only change your life but also help you to sort and analyze your thoughts and topics in a way you never thought possible. With no hidden hosting costs and ad free it's cheaper than the biggest competitors. You're supplied with a blogspot.com sub-domain, but still able to integrate with a custom domain. Blogger doesn't provide a custom domain name service but it will readily redirect your new domain and content from your blog to your chosen domain name. As you can see by custom domain name, which I purchased from Hostgator. Hosting can be an expensive business and can cost you anywhere from $50-$500 a year depending. There are no hidden costs with Blogger, what you see is what you get! Even though Blogger doesn't currently support PHP you can still add custom forms to your blog using services such as JotForm, Cognito Forms or Wufoo. A member of the Google family with a guaranteed reliable and quality service. When you start your Blogger blog you'll be given a Google Account which comes with lots of other goodies such as Gmail, Google Drive, Google Calendar and Google Places. Search Engine Optimisation can be easily achieved with specific blog post description, keywords and labels. Google account comes with lots of other tools like Google Webmaster tools and Google Analytics, Google Adsense which can improve the performance of your website and allows you to monitor your traffic. 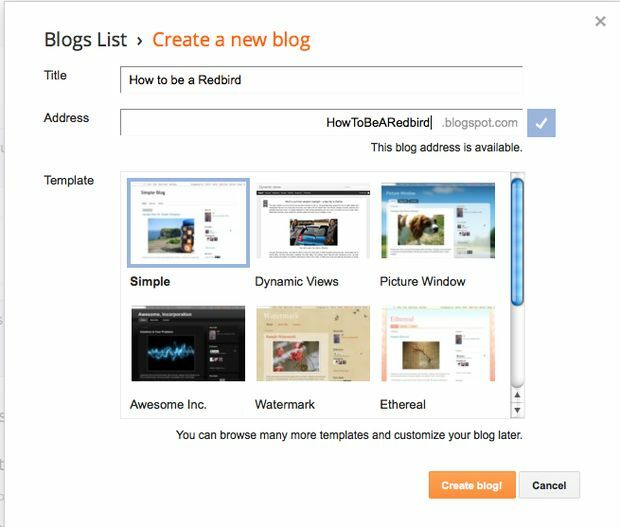 When I first started using Blogger I was a complete novice. But I soon started to pick up on easy customisation techniques and learned how to integrate Adsense and other advertising into my blog. Enter your Gmail and password. Type in the title of your new blog in title box. Type in short address of blogs title in the address box. Type up post in post field below post box. Check it over for spelling mistakes or grammatical errors and then publish. Definition of a blog: A regularly updated website or web page, typically run by an individual or small group, that is written in an informal or conversational style. Originally a blog was similar to writing an online journal which is updated daily by the author. Over the past ten years software programs have improved making the blogging process easier. Starting a blog post is easy, just type up your post, press publish and it's out there for the world to see. You don't need technical know-how to start a blog. With over 20 million blogs in existence, it can't be that hard, there are plenty of articles and websites to draw upon if help is needed. Does it Cost to Blog? Use a free blogging platform and take the plunge. Later on you can move up to a self-hosted platform. Having a self-hosted blog can be inexpensive and you can buy a domain name for as little as $12.95 a year. Blogger.com - My personal favourite and preferred free platform, owned by Google. Customisable, domain name will include "blogspot.com". You can customise it with your own domain name. Tumblr.com - The least customisable, but still one of the simplest platform to use, could be a good starting point. Wordpress.com - Wordpress is free, has an easy dashboard to use. Wordpress.org - The difference with "Wordpress.org" is simple, it's a self-hosted platform. You can use a self-hosting company to host your blog. Start by writing a list of words that relate to your website/blog. A .com name is more memorable and will be more valuable than any other extension you choose. After purchasing your domain name use a company such as Hostgator as your platform, this makes the process much simpler. Many people don't understand the value of a blog and the options it can give you. The potential is pretty endless. You can make a good living blogging if you know where to start. In this next section I'll show you how to monetise your Blogger blog. CPC is pay per click advertising, which means every time someone clicks on an ad from your blog, money automatically goes into your Adsense account. Affiliate marketing is making money by selling other peoples products. As an affiliate your reward will come when the purchase is made. You can sell ad space from your website/blog to advertisers. It's certainly worth looking into. How Long Does it Take to Make Money from a Blog? Blogging is not "a get rich quick" scheme you need to put time and effort to reap the rewards. You need a really good blogging plan to get you started. After that you need to start writing blog posts and get people interested in your blog. Computer knowledge will also stand you in good stead when you start out. That's why sticking with your idea and doing thorough research, making mistakes and learning along the way are all vital. 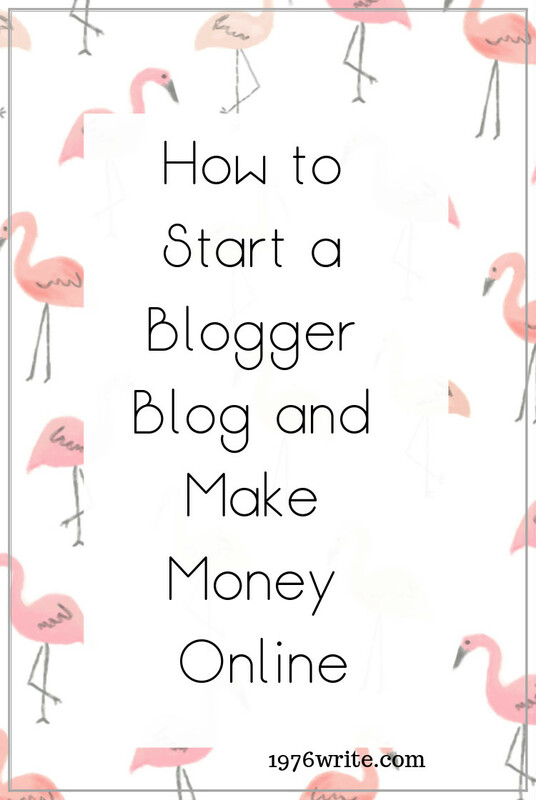 If you're blogging to make an income you need to stick with it even when the going gets tough. 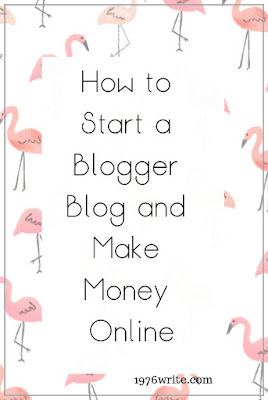 Once you've started your own blog you can start looking into other ways of generating money. Most people give up before they get past the first hurdle and don't make any money at all. You won't make money overnight but you will start to build a readership which you can turn into a customer base. There are many techniques that can be used to get you started to earning cash. But don't be discouraged, if something doesn't work you try something else and start building on that. This method is often bypassed by a lot of bloggers. You can ask your readers to donate a small amount to keep your website running. You can do this with PayPal.Me, by placing a simple button somewhere visible on your main page. You can build an email list when people register or sign up to a monthly newsletter or for a free ebook. Many magazines and newspapers are using this method due to low sales figures. You can offer extra benefits to your readers with a premium membership. Many blogs started as a service, offering coaching, financial help, administrative services etc. You can charge your clients for your professional services through your website. This is a good steady income stream to have alongside your affiliate sales. Create your own courses and sell them on your blog. You can do this through companies such as Udemy by creating your own online course. This is one of the most popular ways to make money. With the introduction of Apple IPad and Amazon Kindle, or platforms such as Payhip you can sell your ebooks independently or to a wider audience through Amazon. If you already have a hobby, use that to start selling your products. With a website the world's your oyster! When you're writing blog posts you can place affiliate links within each link and sell other people's products. One of the best places to start is Amazon Associates. You have thousands of different products to choose from, and you can use your affiliate links on Twitter to. Sign up to Google Adsense and integrate and customise your own advertising within your blog or website. It's a lot easier than it sounds. You will need lots of traffic for this one. The 50 Million Dollar Question, How Do I Get Traffic to My Blog? Put your blog on search engines such as; Google or Bing. Comment on other blog's with thoughtful and provocative comments. Blogging is a social community so don't be afraid to put those comments out there, you'll be highly rewarded for doing so. Search for forums in your topic area and leave comments linking to your blog. Visitor's Googling your topic will pick up on these comments and find your link, don't use it for self-promotion. The Internet is an environment of "give and ye shall receive", if you stick to this the rewards will come. Search engines gravitate towards well-established blogs. That's why it's important to get links from directories, and other websites and bloggers. The more your blog grows the more likes you'll get and your traffic will grow, this will take time so don't be dismayed "build it and they will come". Google's goal is to build a perfect search engine full of information at the click of a button. Kind of like a giant library, of sorts. The more posts you write, you'll discover they slowly disappear. I've created extra pages such as a shop and my work page for people to look around. Try and link to old blog posts in each post you publish. Your title tag will show up on the top of your browser window. It determines what your site is about. Think of something simple and eye catching such as "Joanne's Art/Art, Illustration and Other Stuff". Anchor text is the clickable text in a hyperlink. Anchor text should always be relevant to the page your linking to. Keywords are ideas and topics that relate to what you're blogging about. Ad placement is important when your trying to make money with advertising. You can usually customise your ads to blend in with your blog and also run experiments on ad size. Make your blog more human by adding your own experience to the mix. Give your readers a variety to read and see which is the most popular. This is quite a new idea with Google and will help you gain insight into which blog posts are making the most money, which keywords are being used and where you get your traffic from. This I can't say enough, study other people's blogs, use the information you've gathered wisely and make your own mark on the internet. "Content is King". Use Google to solve any problems you have, the information is out there for you to tap into. Writing a fresh blog post can seem like a monumental task, stay focused and don't let social media bog you down or get in your way. Yes it's an important part of building traffic but spending long periods doing nothing else will get you no where.